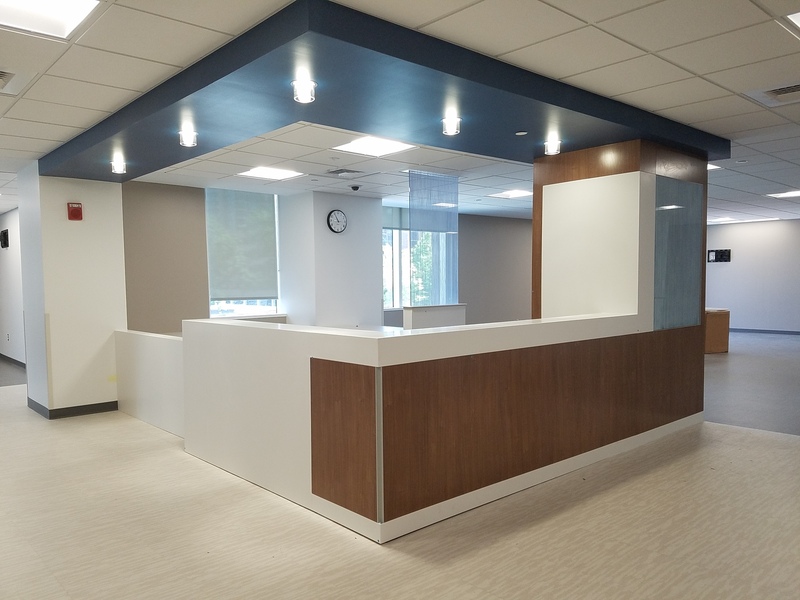 Washington University School of Medicine has been in the process of refreshing their facilities for the last few years, both Barnes-Jewish Hospital and St. Louis Children's Hospital. 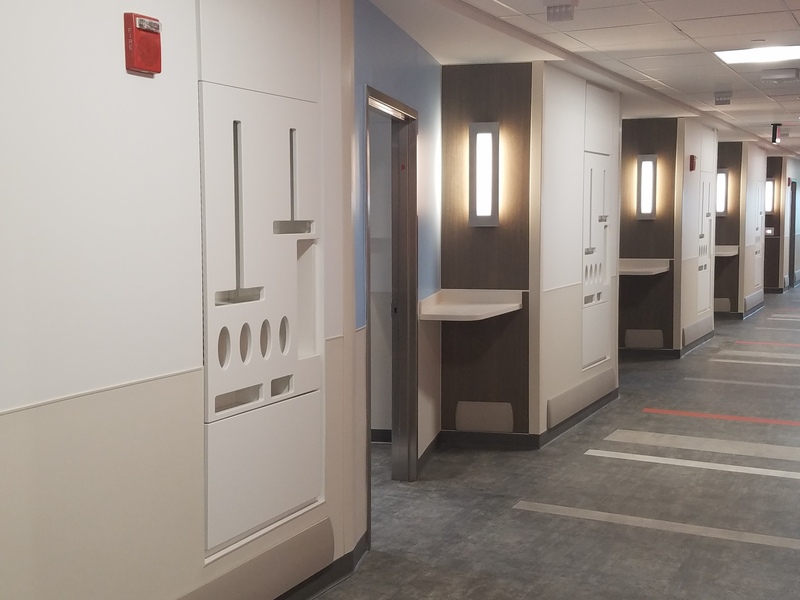 We are proud to be working with them on several projects, including the recently finished Barnes-Jewish Hospital North. Stevens Advantage products installed include 1200 Tradition series Casework. 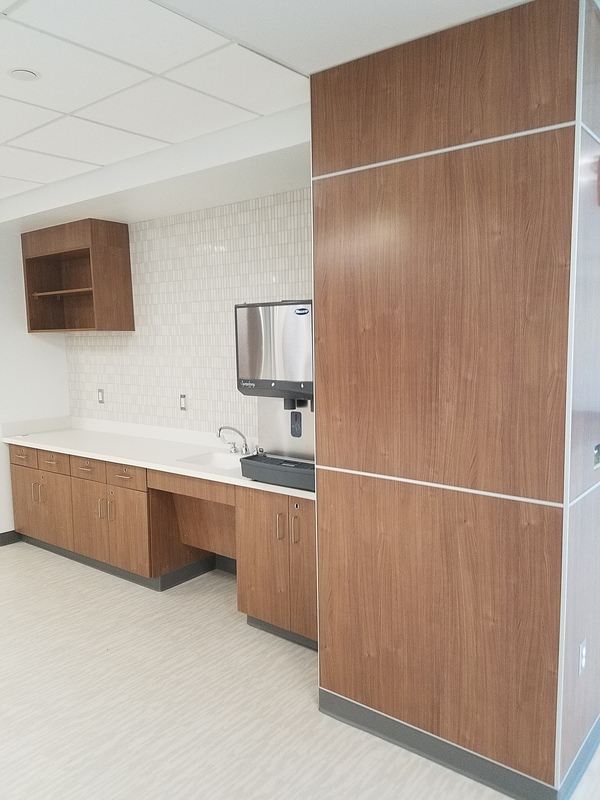 Our millwork team produced Wood Veneer Lobby Panels, PLAM Wall Panels, Allure (NUDO) Wall Panel Systems, Headwall/Footwall Panel Systems, Stone Lobby Desks, Nurse Stations, Reception Desks, Custom PPE Cabinets, Patient Wardrobe Units, Dining Benches, Wood Handrails, Solid Surface Cabinets and Door Jambs. Project architect was HOK Architecture with ACW Alliance serving as construction manager. Stevens Advantage laboratory casework and furniture is ideal for middle school all the way through professional lab environments. A key element of designing the space is selecting materials that offer the best fit for the use they will incur. Stevens Advantage offers a clear path to selecting an appropriate worksurface for educational and commercial science-related laboratories. Active chemicals used in these areas range from very mild to extremely potent. The concern comes when these chemicals come into contact with the worksurface on a table or storage cabinets. 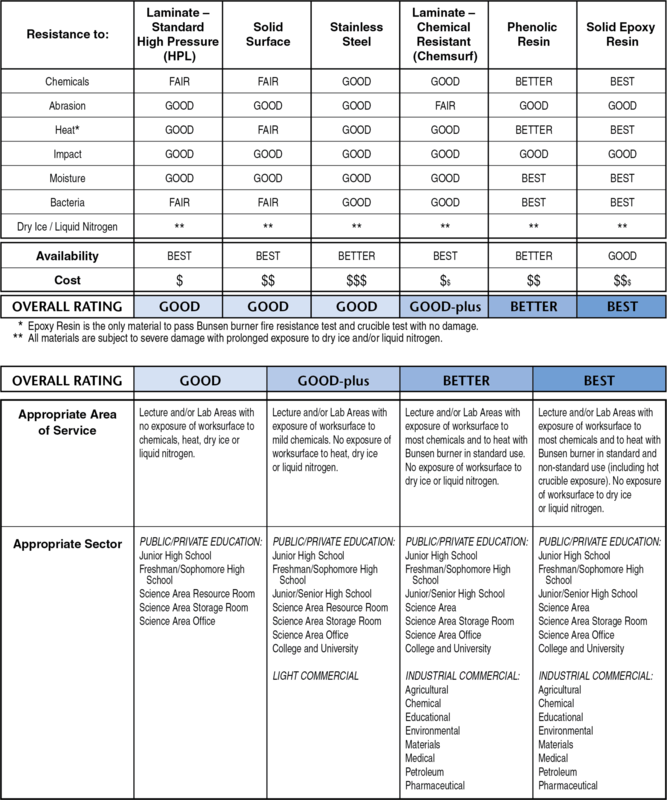 Extreme heat and cold are attributes to consider, along with cost and availability. Our casework is designed to give your projects an advantage in vetted materials and superior construction. The strength of each component has been tested and evaluated to ensure a long and trouble-free lifespan. Shall be a high pressure decorative face PF-42, laminated to core with catalyzed poly vinyl acetate (PVA) adhesive, at a minimum pressure of 80 pounds per square inch (PSI), at an average bonding temperature of 180 degrees F, capped off with a balancing laminate backer sheet. Worksurface and backsplash/endsplash(if required) shall be factory finished. 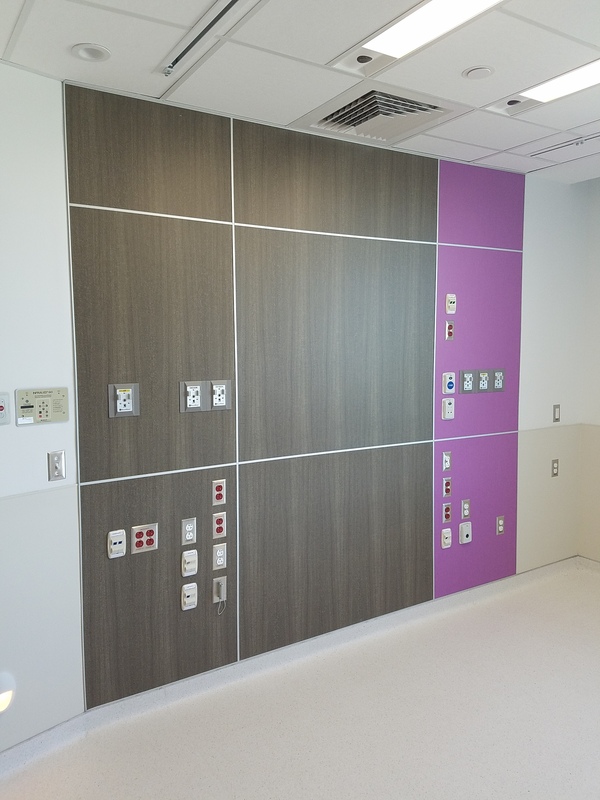 Color/pattern, thickness, core material and edging selected from Stevens standard selections. Shall be a solid homogeneous material suitable for many functional and decorative applications. It is a fully densified composite of modified resin including acrylic and mineral filler and is available in differing gloss levels, as specified. Shall be a 300 Series Austenitic type of the typical grade 304 comprised of Chromium (17-25%)/ Nickel (8-25%), non-magnetic, not heat treatable. Stainless steel is available in a variety of custom finishes and in gauges of 14, 16 and 18, as specified. As gauge decreases, thickness and weight increase. Shall be a high pressure Chemsurf laminate decorative face, laminated to core with catalyzed polyvinyl acetate (PVA) adhesive, at a minimum pressure of 80 pounds per square inch (PSI), at an average bonding temperature of 180 degrees F, capped off with a balancing laminate backer sheet. Worksurface and backsplash/ endsplash (if required) shall be factory finished. Color/pattern, thickness, core material and edging selected from Stevens standard selections. Shall be kraft paper layered and impregnated with phenolic resin, then heat fused under high pressure. Worksurfaces shall be factory fabricated as specified, with all exposed cutouts and edges profiled to 3mm bevel/radius and polished, including the backsplash/endsplash, if required. Color/pattern selected from Stevens standard selections. Shall be monolithic material of epoxy resin, silica hardener and filler materials cured in an oven to form the worksurface. This factory finished lab grade worksurface is made to specification with exposed cutouts and edges beveled/radiused to 3mm, then dressed and polished with the special chemical resistant surface finish. Includes bottom drip groove. Color and thickness selected from Stevens standard selections. NOTE: These worksurfaces comply with their respective standards. Our expansion in Teutopolis is well underway with steel framing being erected in January. The addition will increase the manufacturing footprint by nearly 50,000 sq ft, and will be operational in the spring. It will house a new assembly line, increasing capacity. This is the second expansion project in 2018, the first being the purchase of the 200,000 sq ft Stevens Avenue Facility in nearby Effingham, Illinois. Stevens is actively preparing and planning for growth, with an eye to better serving our customers. Watch for more updates as construction gets underway! Additional photos available on our social media pages.